(Newser) – Many Ohio State University students are taking a break from studying for final exams by making a bacon run. 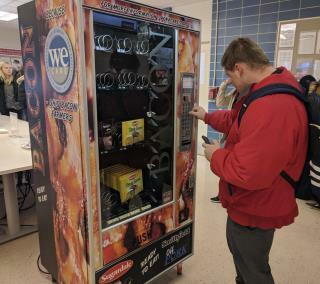 Senior Sarah Page, who studies meat science, says the bacon vending machine at the College of Food, Agricultural, and Environmental Sciences has turned out to be even more popular than expected. It has to be restocked four or five times a day, reports the AP. It offers cooked bacon strips and bacon bits for $1. Proceeds will benefit the meat science program. Members of the program are responsible for the bacon machine operation on the Columbus campus. The Ohio Pork Council sponsored the machine, with bacon donations from Smithfield, Hormel, and Sugardale. The machine will remain on campus through Dec. 13. Pre-dental student Shay Merritte loves "the overall Ohioness of it." And the bacon. ALL MEAT is a class TWO carcinogen, and ALL PREPARED MEAT (including bacon) is a class ONE carcinogen. That is all the "Meat Science" one needs to know to help keep them alive and healthy. "Meat Sciences:" now, there's a major one can really sink one's teeth into.